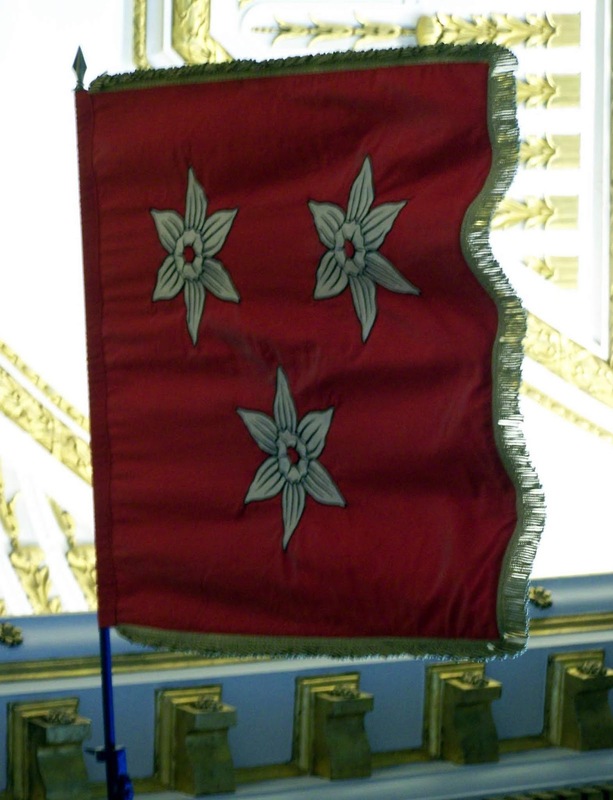 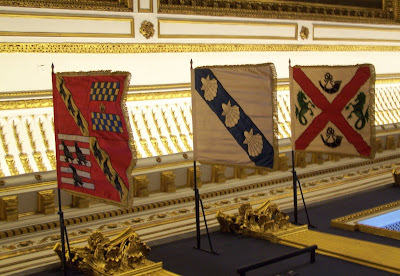 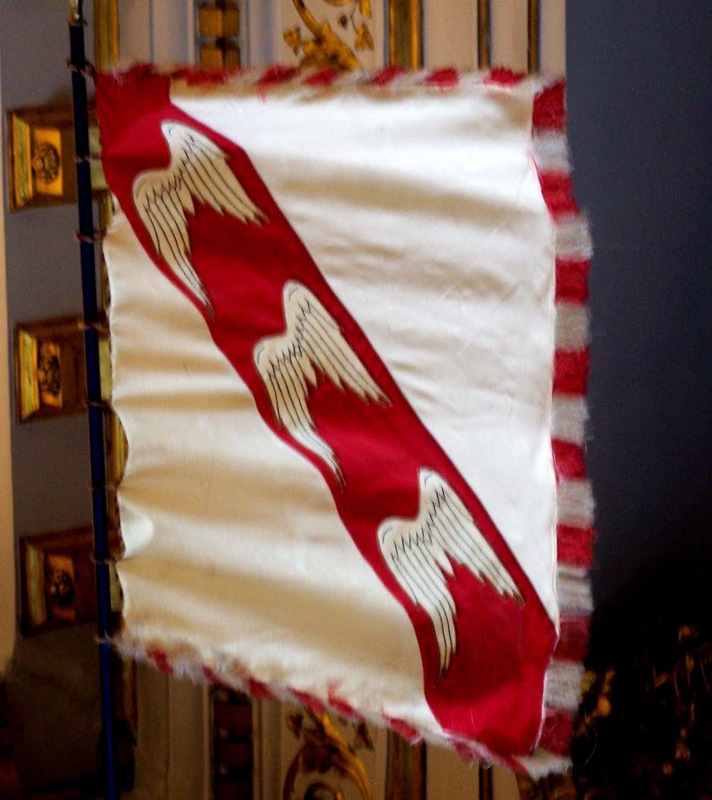 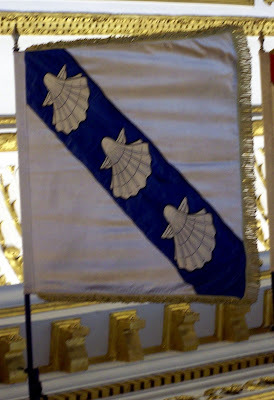 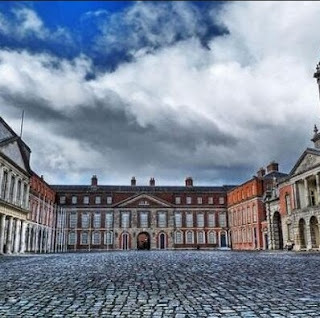 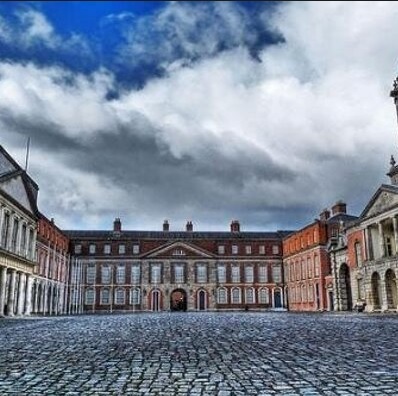 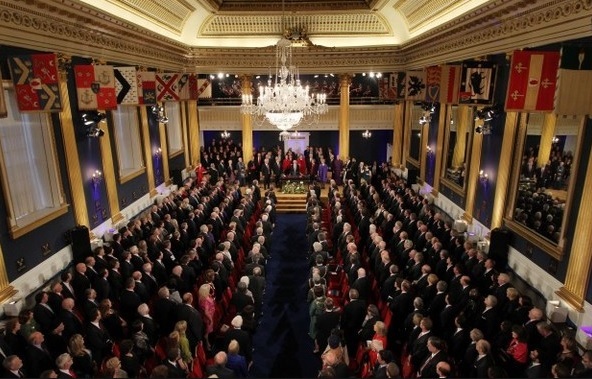 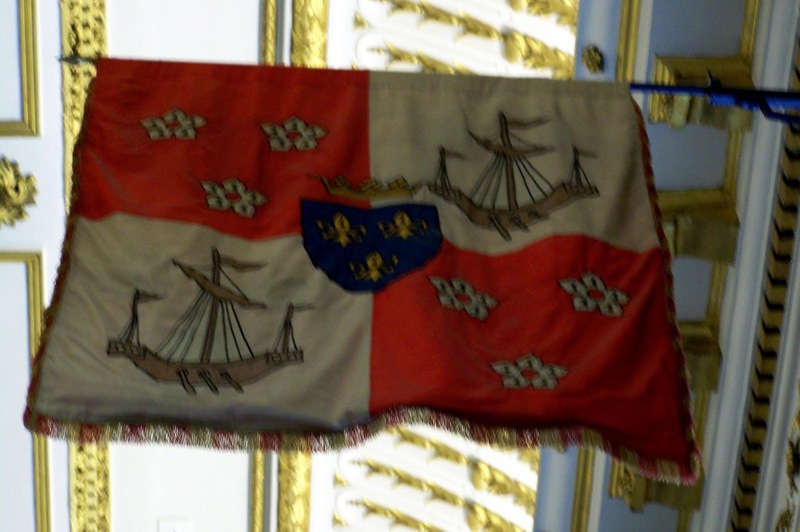 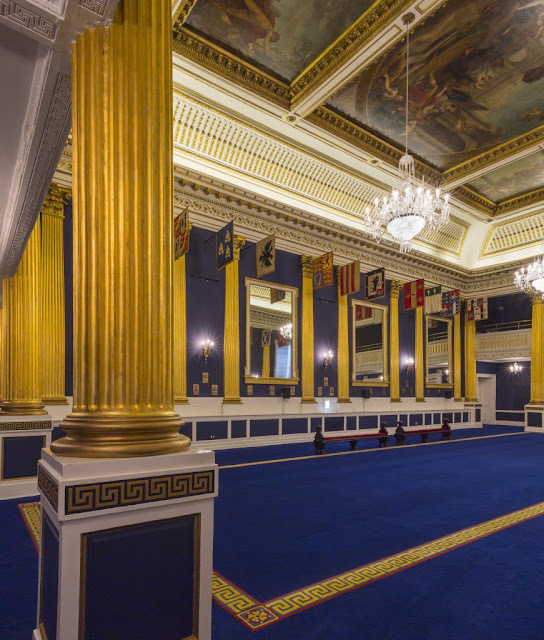 Here we look at the 'heraldic banners' in Dublin Castle. 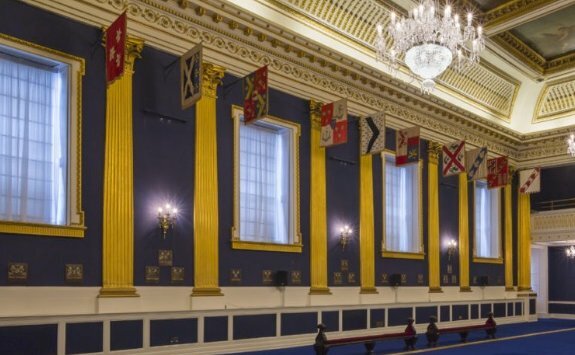 These banners can be noticed on state occasions such as the inauguration of a president or during a state visit (most recently the visit of Pope Francis on 25 August 2018. 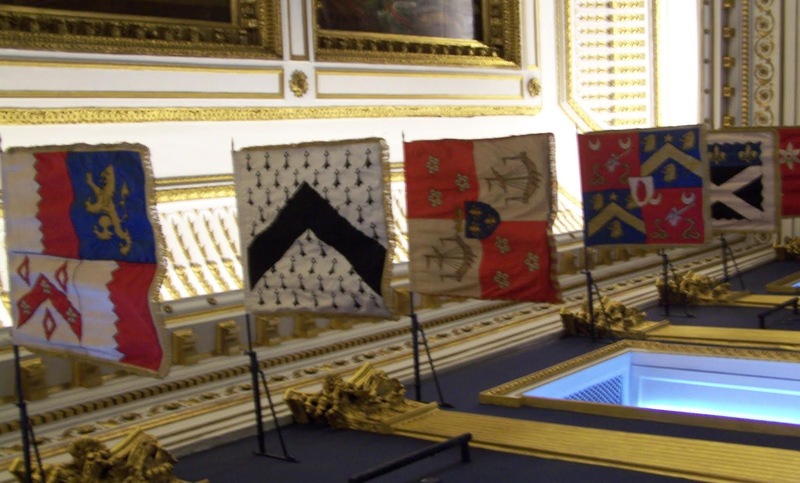 Here all the families associated with these banners are identified. The family members were members of the Order of St Patrick. 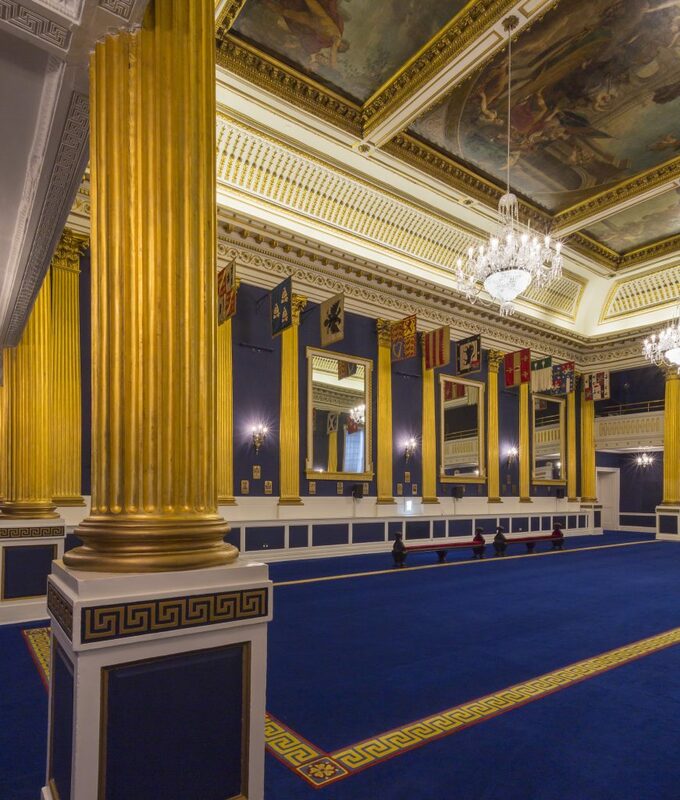 The hall is known as St Patrick's Hall. There are are 22 flags or banners on display. First we list the most recent members associated with each banner (21 of them) and then for the 22nd banner we have the Royal Arms. 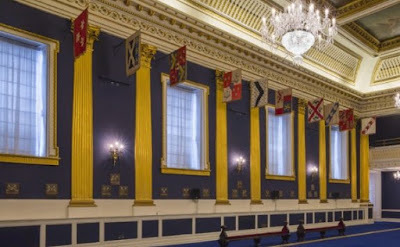 Ten of the eleven banners on one side of St Patrick's Hall in Dublin Castle. Rotating them for the viewer, the first three are for the Earl of Shaftesbury, the Earl of Granard and the Earl of Gosford (?). 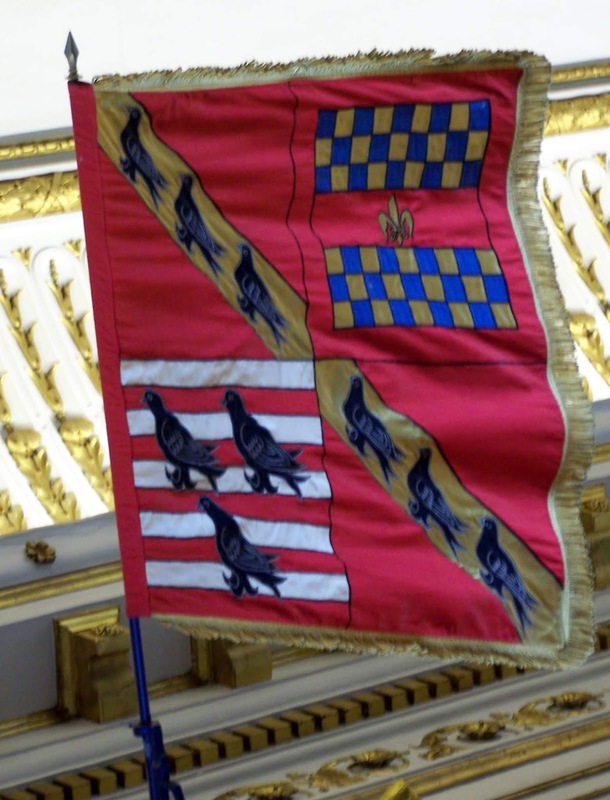 The banner for the Earl of Mayo is behind the poll. 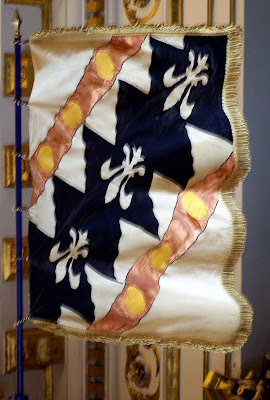 Thge next four are the Royal arms (now not the correct way for viewing! 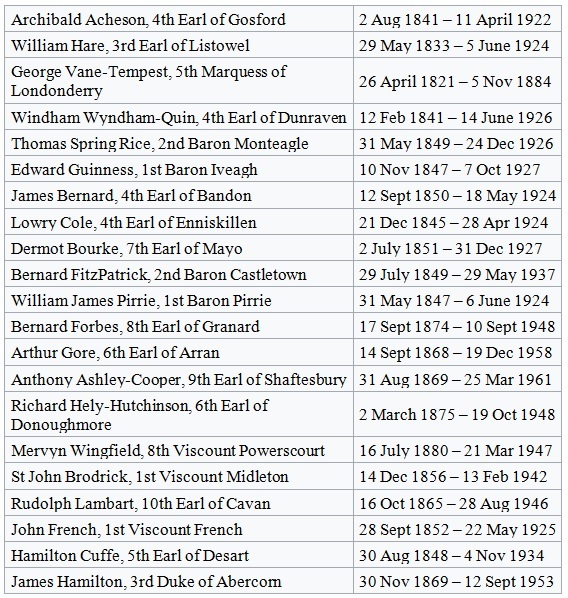 ), the Earl of Listowel, the Earl of Enniskillen and the Earl of Arran. 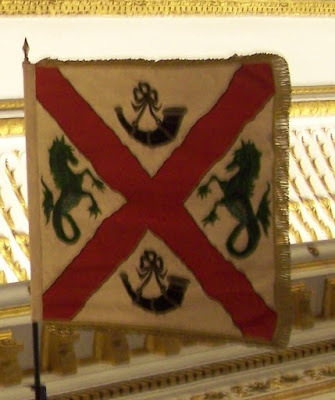 Richard, 6th Earl of Mayo was a member of the Order of St Patrick, these quartered arms can also be seen at St Patrick's Cathedral. 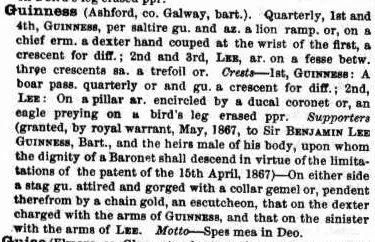 The arms are Burke, Deane, Roden and Hamilton. Richard was son of Robert Bourke, 5th Earl of Mayo and of his wife Anne Charlotte Jocelyn, granddaughter of Robert Jocelyn who became Earl of Roden in 1771. 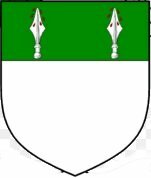 Robert Jocelyn was married in 1752 to Anne, daughter and heir of James Hamilton, Earl of Clanbrassil. 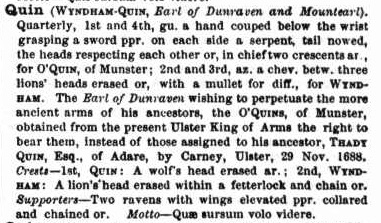 John Bourke, 1st Earl married c. 1725 Mary, daughter and co-heiress of Joseph Deane, Chief baron of the Exchequer of Ireland. 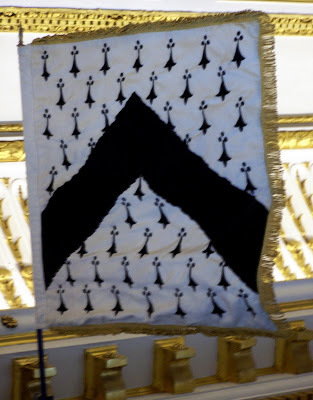 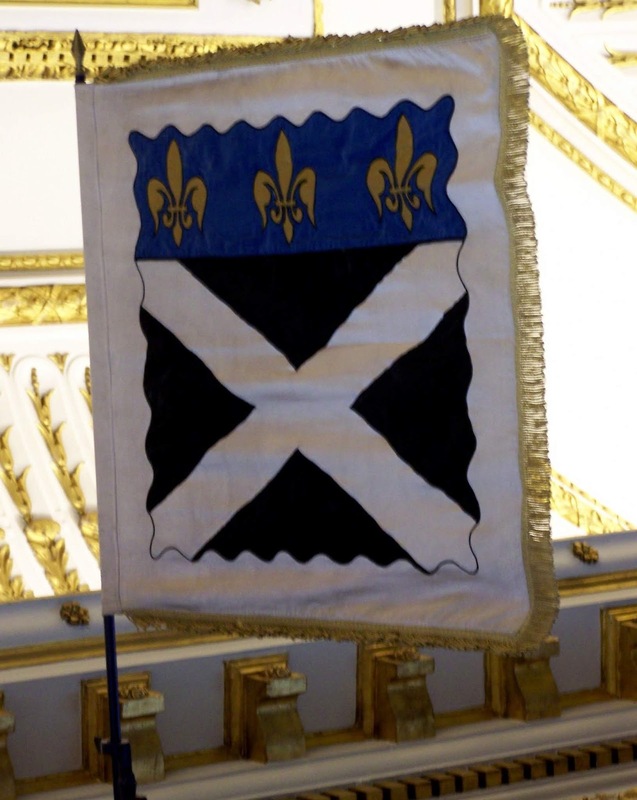 The second banner is that of Earl of Shaftesbury. Anthony Ashley Cooper was born in Dorset in 1621 to Sir John Cooper and Anne Ashley (d. 1628). His parents' marriage in 1616 brough together two wealthy families with extensive estates in Dorset, Hampshire and Wiltshire. 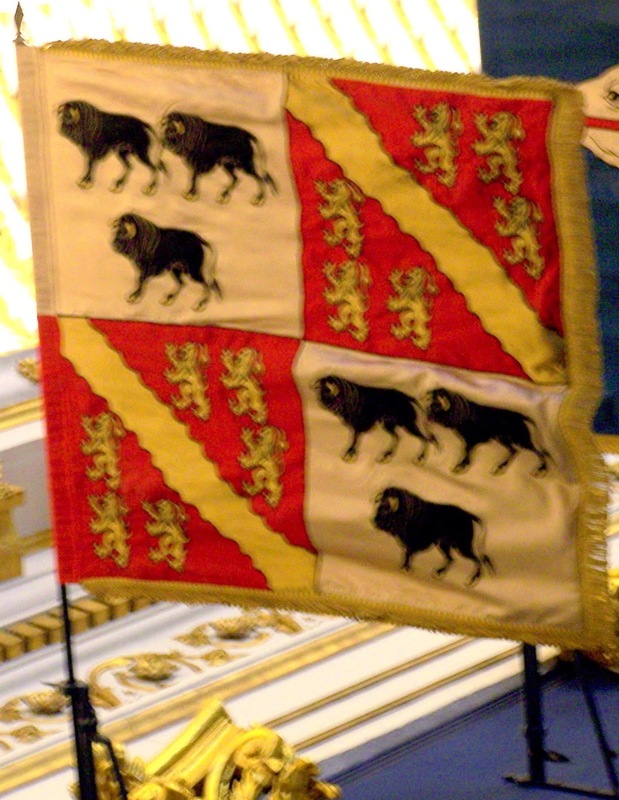 Arms of Ashley and Cooper for the Earl of Shaftesbury.